Philosophy of development, political/cultural and population geography, psychological and cultural barriers to poverty alleviation, agrarian reform, project planning and implementation, organizational management. Post-harvest technology transfer. Social exclusion and emancipatory development. Qualitative evaluation. Higher education curriculum design and governance. Building degree programs on Sustainable International Development. Laurence Simon is Professor of International Development and Director of the Center for Global Development and Sustainability. He was the Founding Director of the Graduate Programs in Sustainable International Development from 1993 to 2014 and served as the Associate Dean for Academic Planning at the Heller School for Social Policy and Management from 2003 until September 2009. Dr. Simon currently serves on the Working Group, appointed by the Prime Minister of Sri Lanka, for the design of a new university in Sri Lanka. Since 2018, he also serves as the Joint Editor-in-Chief of CASTE: A Global Journal on Social Exclusion. Simon’s research and teaching center on critical issues of social exclusion and emancipatory development. His current research focuses on psychological and cultural barriers to poverty reduction and on the role of social movements in development. In 2007, he took a leave from Brandeis to serve as the senior adviser on global poverty to the executive director of the Google Foundation. He has also been a Visiting Scholar at the Freeman Spogli Institute for International Studies at Stanford University. In the late 1970s, Dr. Simon was a program director for Oxfam America and launched its work in Central America and the Caribbean. Later as Oxfam’s first director for policy analysis and advocacy, he helped usher in an era when major NGOs look critically at national and global aid and development policy. 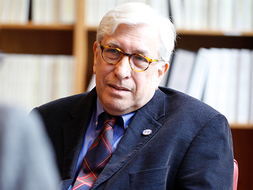 His research effort in 1981 on the impact of the U.S. financed El Salvador agrarian reform prompted a major investigation by The New York Times that resulted in Congressional hearings. Since then he has lectured widely in the United States, Europe and Asia on problems of landlessness and agrarian repression. Dr. Simon founded the American Jewish World Service (AJWS) in 1984 and was its President until June 1989. At this time, he served on the executive committee of InterAction, the association of U.S. international development organizations. During his AJWS years, and beyond, Dr. Simon collaborated with Israeli scientists Drs. Shlomo Navarro and Jonathan Donahaye, and the American disaster mitigation specialist, Frederick C. Cuny of Intertect, which resulted in sweeping innovation in the technology of emergency food relief and methods for on-farm and national grain storage. Simon directed the establishment and monitoring of UN World Food Programme field trials for elimination of losses of emergency grain en route to or in areas of famine. This work led to his founding of Grain Protection International, an NGO, for further R&D. Subsequently, Dr. Simon founded GrainPro Inc. which is today the leader in hermetic storage of durable grains and high value commodities eliminating chemical insecticides and the ozone-depleting fumigants mandated by the Montreal Protocol. At the request of the Soros Foundation, the International Rescue Committee and Intertect, Dr. Simon worked on Sarajevo relief during the Serbian siege of the city assisting Fred Cuny to design and implement emergency winterization programs. Their major effort was the construction of a below ground water treatment plant that provided the only potable water for the city during the war. Sadly, Fred Cuny was killed on another Soros mission two years later in Chechnya. In 1990 and 1991, Dr. Simon served as the resident evaluation officer for a joint United Nations Development Programme / World Bank national poverty alleviation program in Sri Lanka. He has also been an adviser to the World Bank on land reform. His early career was at the City University of New York where he taught in a transitional year SEEK program to raise the academic skills of students from disadvantaged and minority communities. He taught at Fordham University where he served as Assistant to the Dean and administered the Third World Institute where he began his long association with the Brazilian social theorist Paulo Freire. Simon, Laurence. "Chairman's Introduction to the 3rd International Conference on the Unfinished Legacy of Dr. B.R.Ambedkar." 3rd International Conference on the Unfinished Legacy of Dr. B.R.Ambedkar: Re-imagining Religion, Caste and Social Justice in South Asia. Brandeis University. April 28, 2017 through April 30, 2017. Simon, Laurence. "Keynote address: The Prophetic Courage of B.R. Ambedkar in Comparative Perspective." Conference on Quest for Equity: Reclaiming Social Justice, Revisiting Ambedkar (organized by the Government of Karnataka and Central Bengaluru University, India). Bengaluru, India. July 21-23, 2017. Simon, Laurence. On the 25th Anniversary of the Arthacharya Foundation. Ratmalana, Sri Lanka Arthacharya Foundation: 2017. Simon, Laurence. "Development and Justice: Is there an end to poverty in developing nations?." Tufts BUILD Latin America and Tufts BUILD India. Tufts University. October 25, 2016. Simon, Laurence. "India's Social Divide and Religious Culture: Lessons from W.E.B. DuBois, Gustavo Gutierrez, and B.R. Ambedkar." Annual meeting of the American Association of Geographers, San Francisco. March 31, 2016. Simon, Laurence. "Prophetic courage and the challenge of an ethical culture movement for Modern India: Lessons from W.E.B. DuBois, Gustavo Gutierrez, and B.R. Ambedkar." International Conference on Caste, Inequality and Economic Growth: Challenges of Tradition and Modernity, The Heller School at Brandeis University, The Center for Global Development and Sustainability. April 30, 2016. Simon, Laurence. "Paulo Freire and B.R. Ambedkar: In Comparative Perspective." International Symposium on Annihilation of Caste:The Unfinished Legacy of Dr B.R. Ambedkar, The Center for Global Development and Sustainability, The Heller School at Brandeis University. May 3, 2015. Simon, Laurence. Guide to Giving Wisely for Nepal Earthquake Relief. Waltham, MA The Center for Global Development and Sustainability, Brandeis University: 2015. Simon, Laurence, co-authored with Susan Holcombe. "What type of Development Studies for a changing Development Context?." Development Studies Association of the U.K. and Ireland. Birmingham, U.K.. November 16, 2013. Simon, Laurence. "A Pedagogy of the Oppressed: Paulo Freire and Dalit Liberation." Faculty and Research Staff Seminar, Indian Institute for Dalit Studies. New Delhi, India. October 9, 2013. Simon, Laurence. "A Theology of Awakening: Paulo Freire and Subaltern Consciousness." Faculty Study Group, St. Aloysius Degree College. Cox Town, Bangaluru, India. October 13, 2013. Simon, Laurence. "A Theory of Social Exclusion." Distinguished Lecture Series, Centre for the Study of Social Exclusion and Inclusive Policy, National Law School of India University. Bangaluru, India. October 15, 2013. Simon, Laurence. "Development for All: Overcoming Inequality and Discrimination." Distinguished Lecture Series, National Law School at India University. Bangalore, India. October 15, 2014. Simon, Laurence. "Development for All: Overcoming Inequality and Discrimination." Keynote Lecture: TERI University – Brandeis University Inaugural Conference. New Delhi, India. October 8, 2014. Simon, Laurence. "Education and Emancipatory Development." Faculty of Education, Azim Premji University. Bangaluru, India. October 15, 2013. Simon, Laurence. "Emancipatory Development: Lessons from Struggles Abroad." The Chairman's Lecture, Centre for Economic and Social Studies. Hyderabad, India. October 14, 2014. Simon, Laurence. "Non-pesticide Management of Grain Storage: Hermetic Technologies for Reduction of Post-Harvest Losses." Non-Pesticide Management of Pests Unit, Centre for Economic and Social Studies. Hyderabad, India. October 13, 2014. Simon, Laurence. "Paulo Freire and the Subaltern Consciousness." Chairman's Lecture: Joint Session of the Bangladesh Rural Advancement Committee (BRAC) and BRAC University at the invitation of Sir Faisal Hassan Abed, Chairman and Chancellor. Dhaka, Bangladesh. February 4, 2013. Simon, Laurence. "Pedagogy of the Oppressed: An Introduction to the Thought of Paulo Freire." Research Staff Seminar, Society for Participatory Research in Asia (PRIA). New Delhi, India. February 21, 2013. Simon, Laurence. "The Reclamation of Human Personality: B.R. Ambedkar and Paulo Freire in Comparative Perspective." The International Paulo Freire Forum, Turin, Italy. September 20, 2014. Simon, Laurence. "The Reclamation of Human Personality: The Inescapable Concern." The Founder's Lecture: Indian Institute for Dalit Studies.. New Delhi, India. October 10, 2014. Simon, Laurence. "The Tyranny of Place: Paulo Freire and Subaltern Consciousness." International Conference on Literature and Marginality: Comparative Perspectives in African American, Australian and Indian Dalit Literature, Indira Gandhi National Open University. New Delhi, India. February 20, 2013. Simon, Laurence. "The Tyranny of Place: Paulo Freire and Subaltern Consciousness." The Ambedkar Chair Lecture, Centre for the Study of Social Systems, Jawaharlal Nehru University. New Delhi, India. October 9, 2013. Simon, Laurence. "We Shall Overcome: Social Movements for Equality." Programme for the Study of Discrimination and Exclusion, School of Social Sciences, Jawaharlal Nehru University. New Delhi, India. October 9, 2014. Simon, Laurence. "Where There Is No Untouchability." Closing Ceremony of the Ford Foundation International Fellowship Program, Ford Foundation. New Delhi, India. February 23, 2013. Simon, Laurence. "Concepts of Place and Temporality in the Thought of Paulo Freire." Association of American Geographers, Las Vegas, Nevada. March 24, 2009. Simon, Laurence. "Copernicus, Puddleglum and the Poor of the World: Bringing Vision, Competence and Science to Foreign Aid and the New Philanthropy." Invited University Lecture by the Institute of International Studies, the Blum Center for Developing Economies, and the Religion, Politics and Globalization Program of the University of California, Berkeley. University of California at Berkeley. November 6, 2008. Simon, Laurence. "Global Poverty, Development, and Social Change." Unedited interview in the Conversations with History video series (available on UCal website and on YouTube). University of California at Berkeley. November 7, 2008.